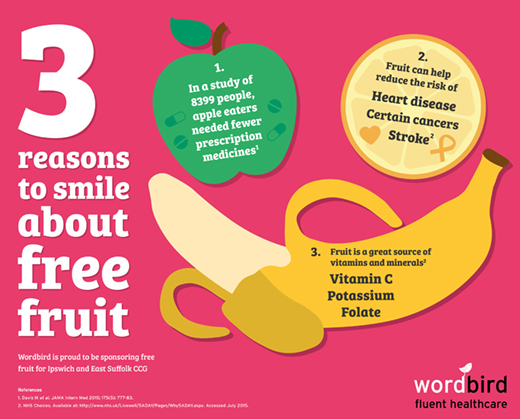 Wordbird is delighted to sponsor free fruit for Ipswich and East Suffolk and West Suffolk CCGs. The two CCGs have provided Wordbird with training. “With recent changes to the decision-making landscape, our training has been invaluable,” says Wordbird Founder Sarah Sowerby. Training has covered topics including ‘who are the key players in practice?’ and ‘how medicines fit into decision making’. “We’re pleased that our small contribution can help CCG staff make healthy eating choices in line with NICE guidance,” says Sarah. Wordbird is committed to produce targeted, genuinely useful and compelling communications for CCG audiences. For more information please contact Sarah Sowerby on 0207 622 5236 or sarah.s@wordybirdy.co.uk.